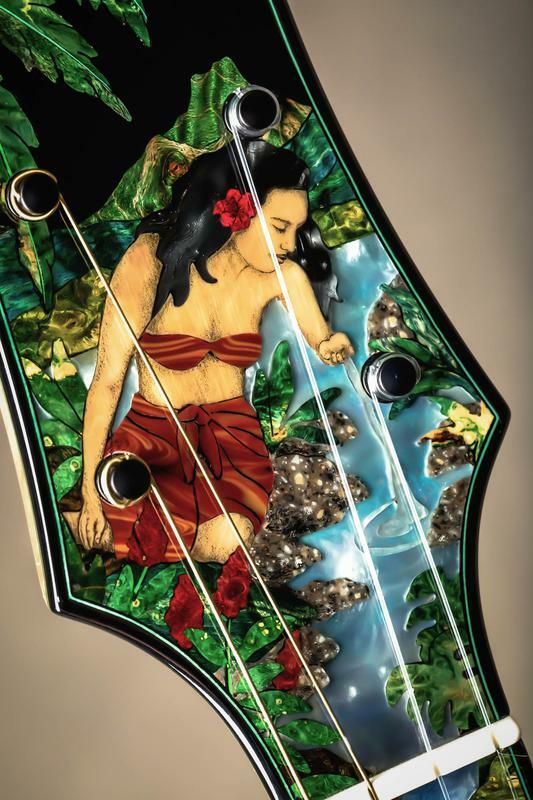 Recently I had the honor of designing an uke for Slack Key Master Ledward Kaapana. 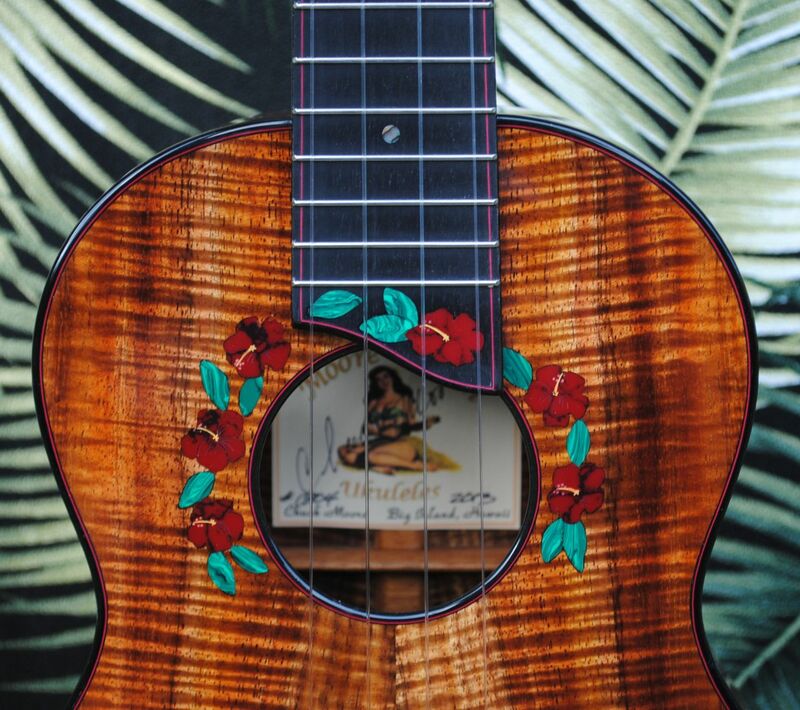 For this unique ukulele I chose a theme of the famous Kalapana black sand beach, paying homage to what many consider to be the birthplace of slack key music as well as being the place where Ledward grew up and learned how to "jus press" when learning how to play the guitar. Sadly, the beach is no longer there as it was overcome by lava in the 1980s. 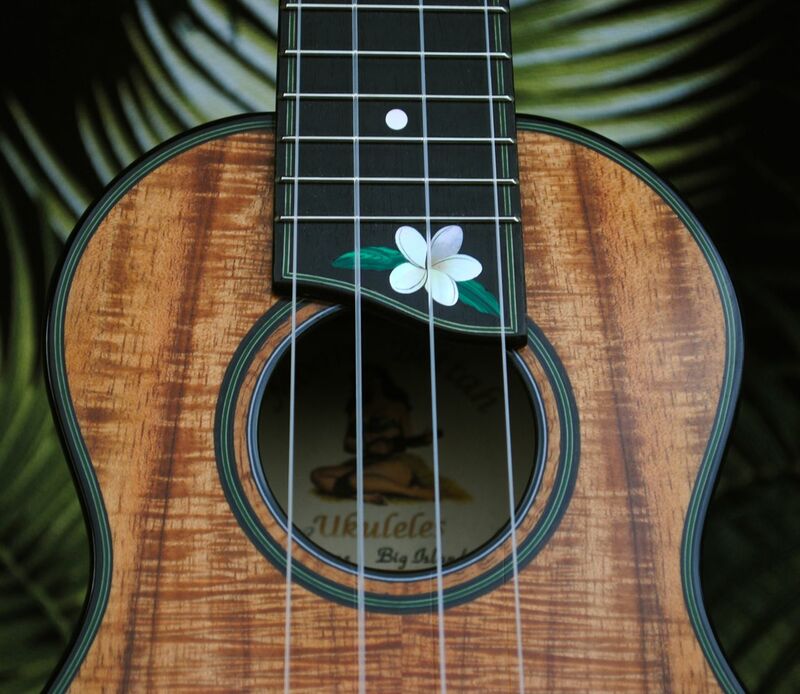 However, the "Kalapana Style" music can still be heard on most nights in Kaimu, next to the old lava flow. 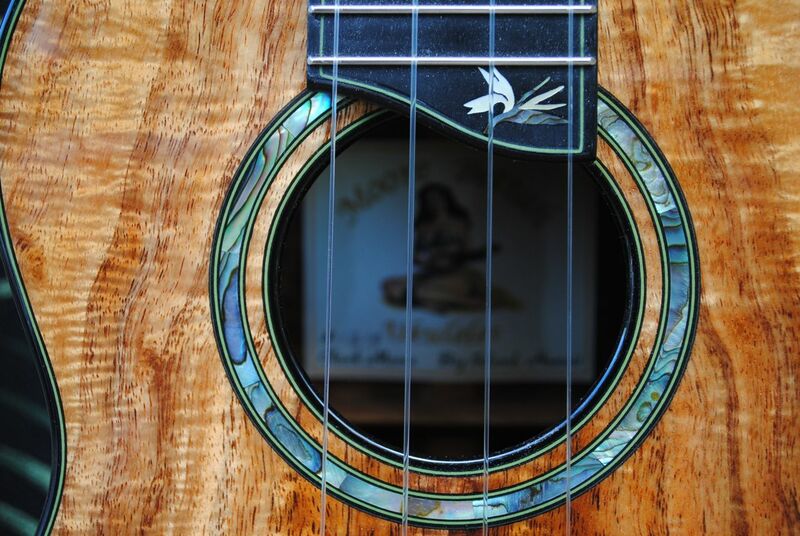 "I often say that if Ledward Kaapana were not so well known as a slack key guitar virtuoso he'd be famous as one of the premier `ukulele artists. 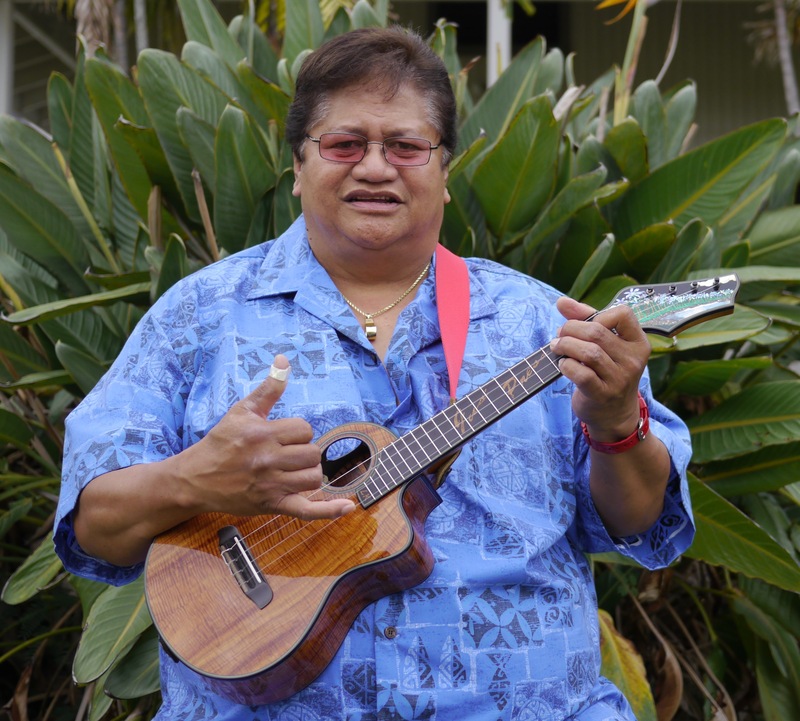 He started his musical journey on the `ukulele about the time he started grammar school, arranged a number of pop tunes as instrumental showpieces when he was in high school, and still keeps his repertoire sharp today. He has a wonderful collection of ukes in various sizes from various makers. 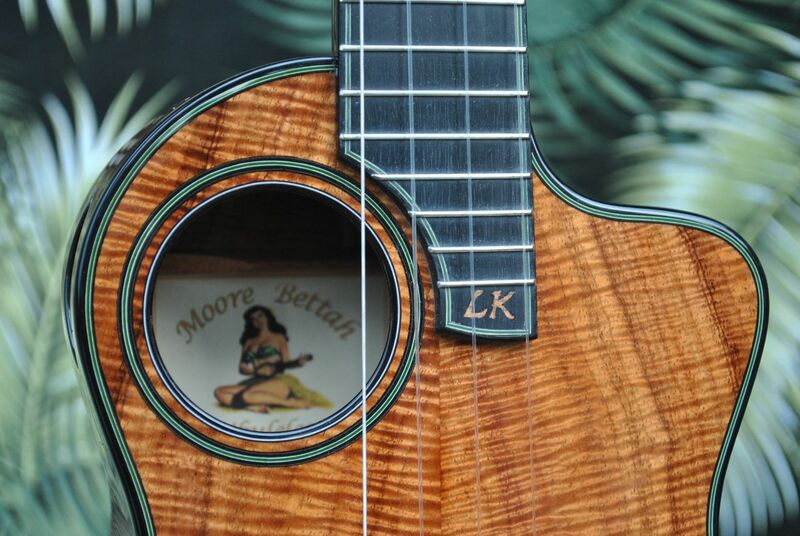 His latest is from Chuck Moore on Hawai`i Island. 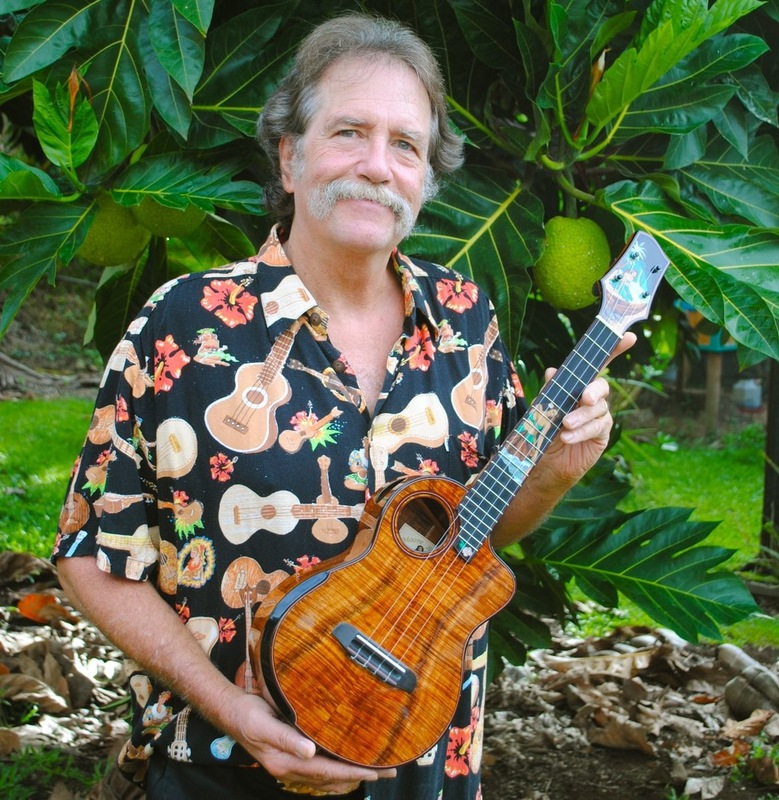 Chuck lives in Opihikao, just down the road from Led's old home of Kalapana. 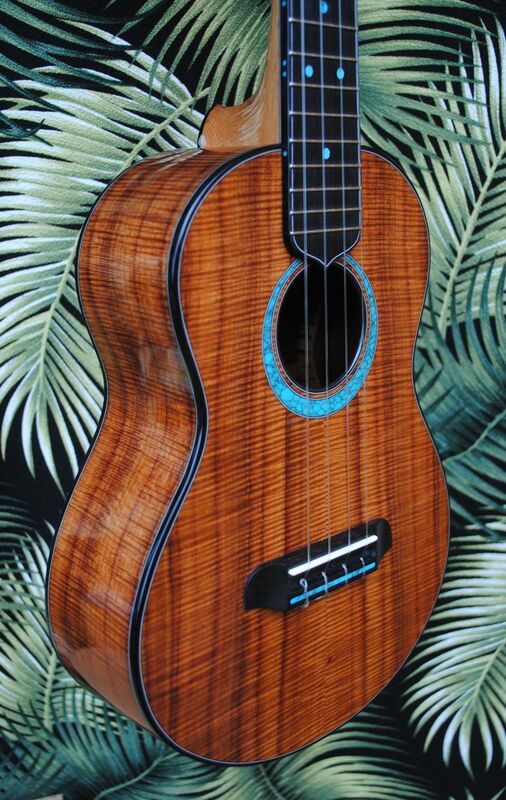 This exquisite tenor features a slant peghead, a cutaway, magnificent curly koa body, an offset soundhole and side port, and several gorgeous inlay features, including Led's "Jus Press" slogan on the fretboard and a representation of the old Kalapana black sand beach on the peghead. 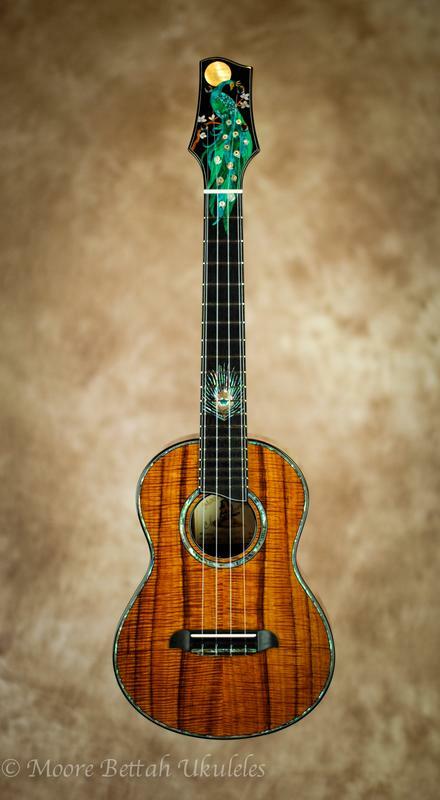 Beyond the stunning appearance, Ledward is enthusiastic about both the playing action and feel as well as the solid musical voice. 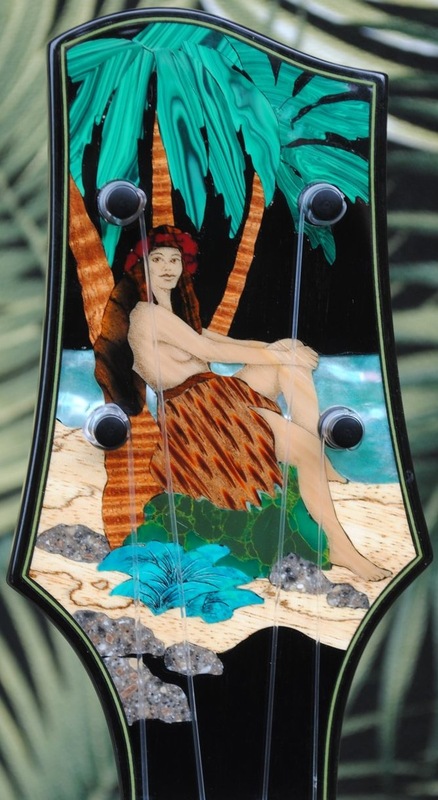 I found a quiet place in his back yard to capture a bit of video of him playing the new uke, an old Hawaiian tune, "Mama E" and his enjoyment comes through clearly." 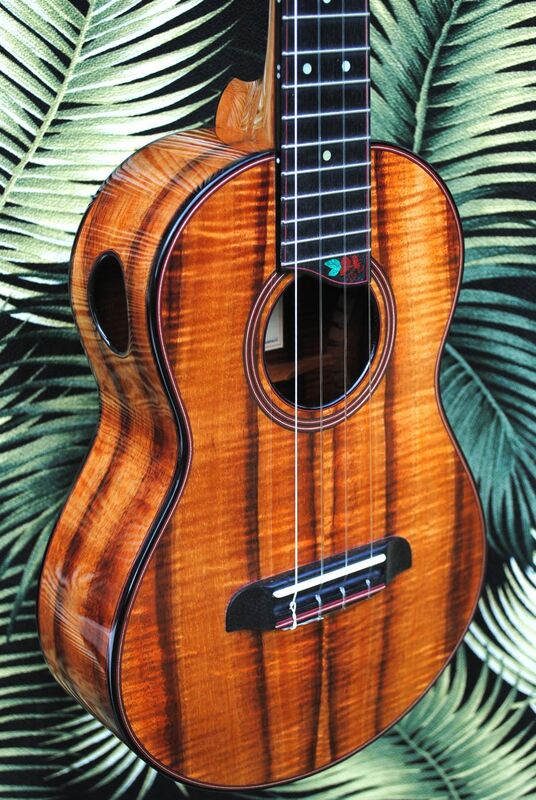 This exceptional, one of a kind tenor ukulele is made from 5A fiddleback Master Grade koa . 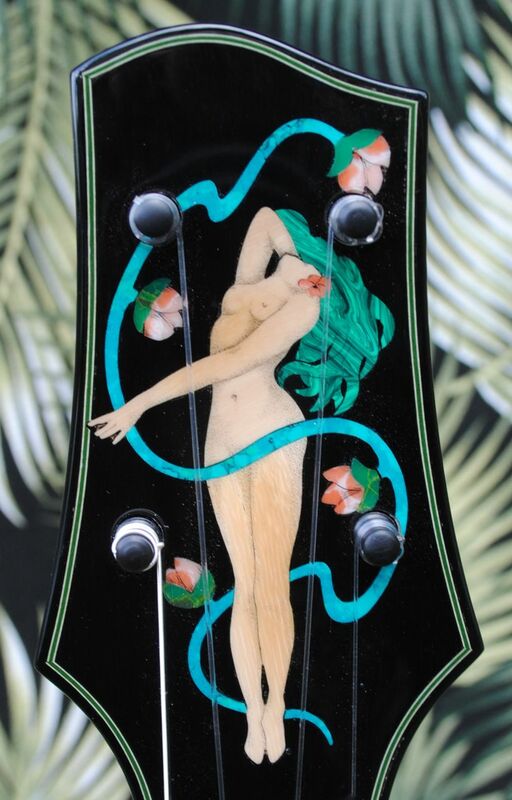 The artistic female figure in the head stock inlay was cut from ancient mastodon ivory tusk and is scrimshawed (engraved). 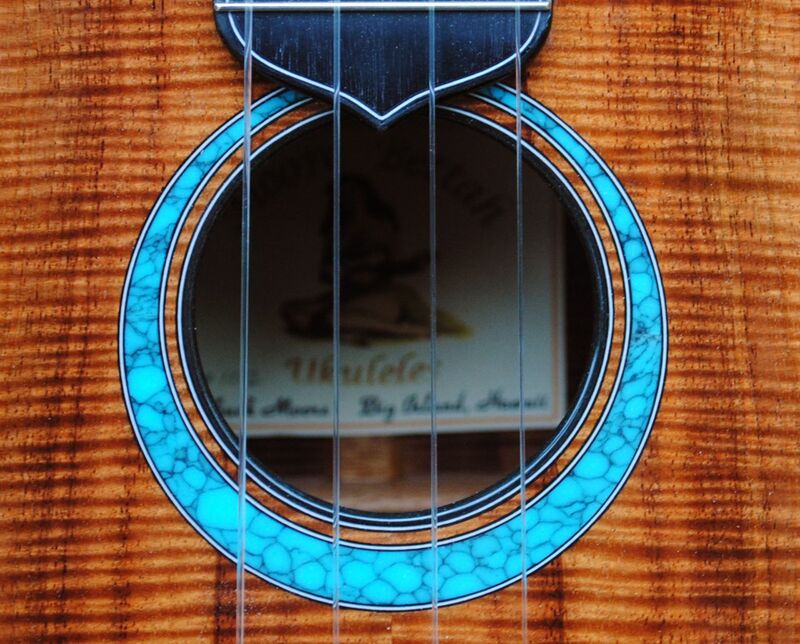 The rosette and fret markers are turquoise recon stone. 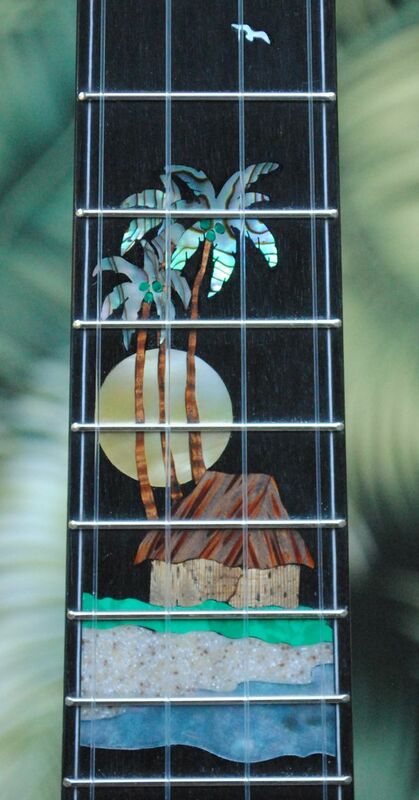 Ebony binding, fret board, bridge and head stock overlay. 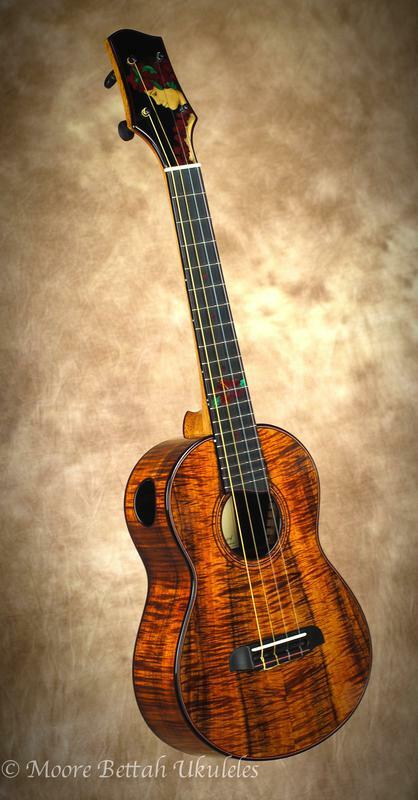 Spanish cedar neck with carbon fiber reinforcement. 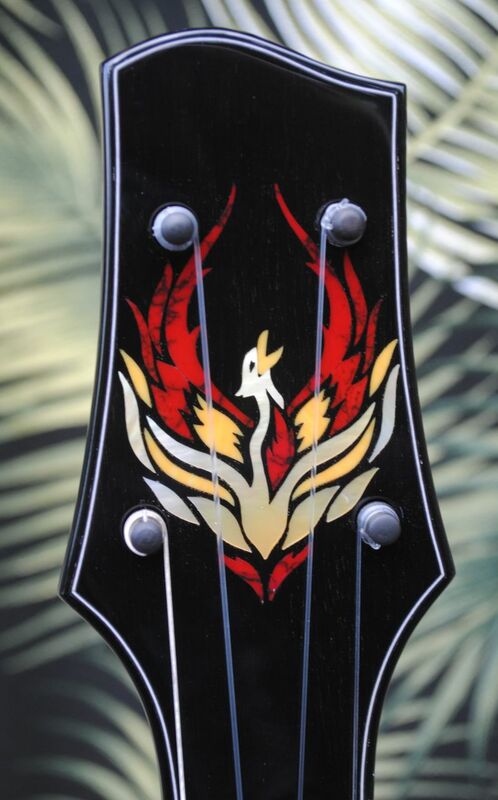 Geared "Peghed" tuners compliment the vintage, classic look. 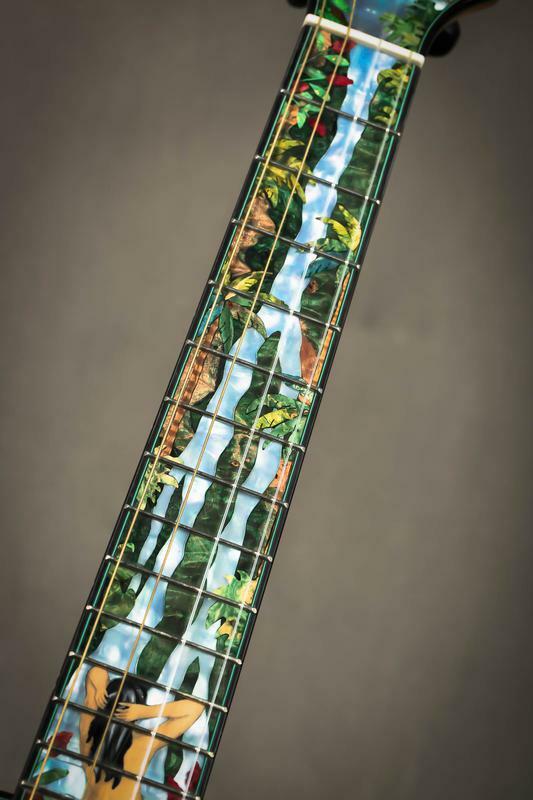 14th fret body/neck connection with 18 frets total. 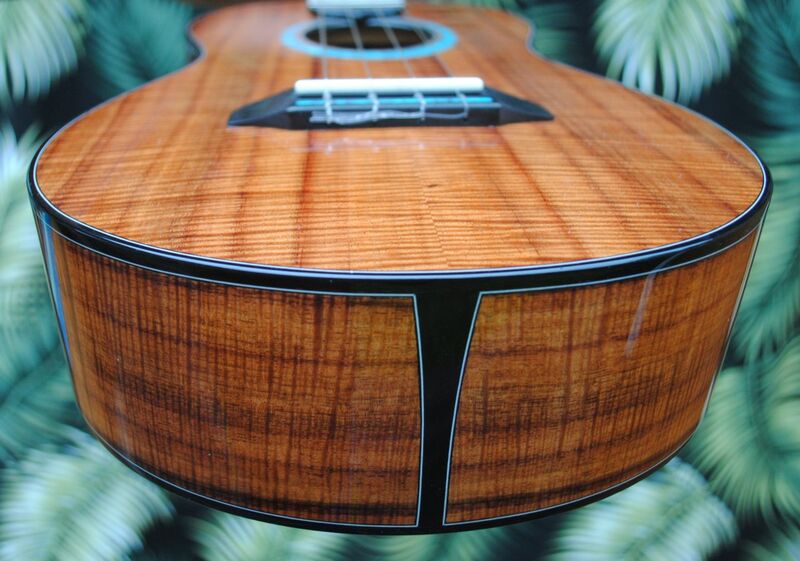 Bound fret oard with black micarta nut and bone saddle. 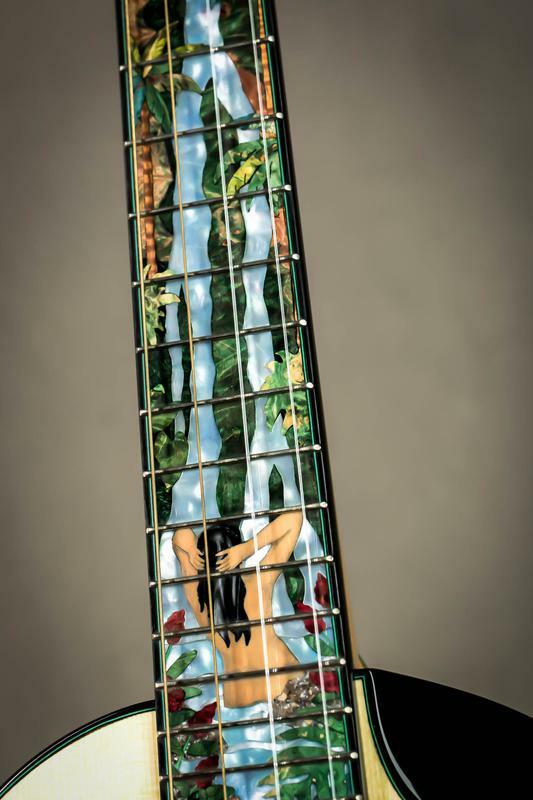 Worth CHLG strings for a full, warm sound with lots of volume and sustain. 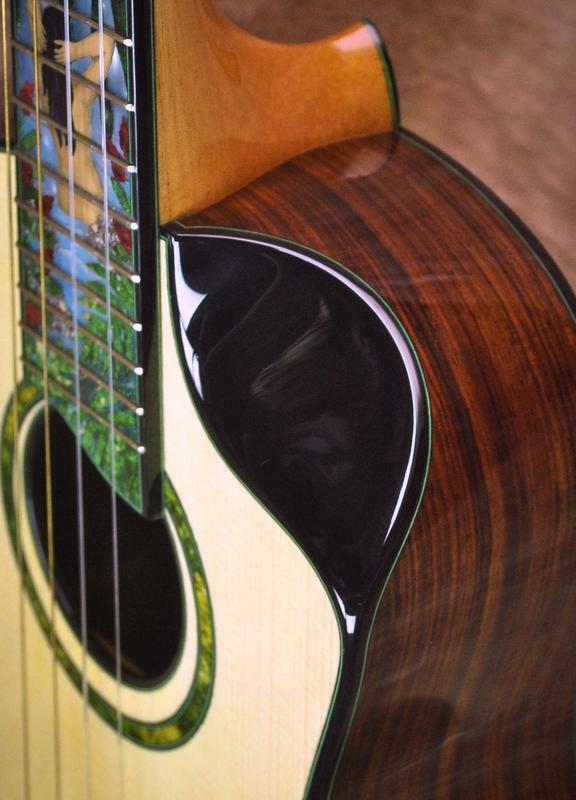 Glossy nitro cellulose lacquer finish. Comes with hard shell case. 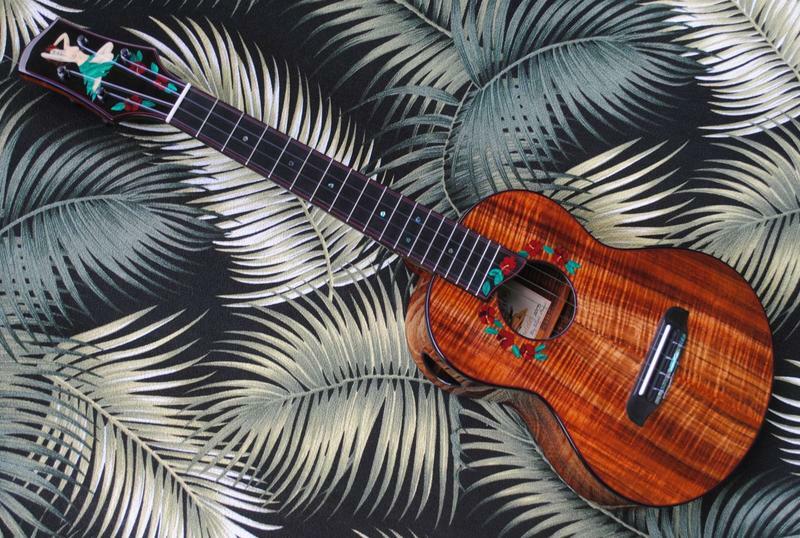 A stunning ukulele in every way. 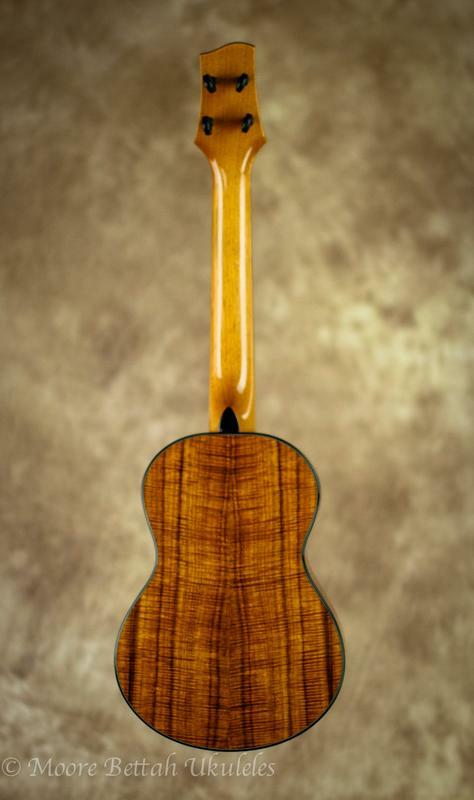 Adirondack spruce top with koa back and sides. 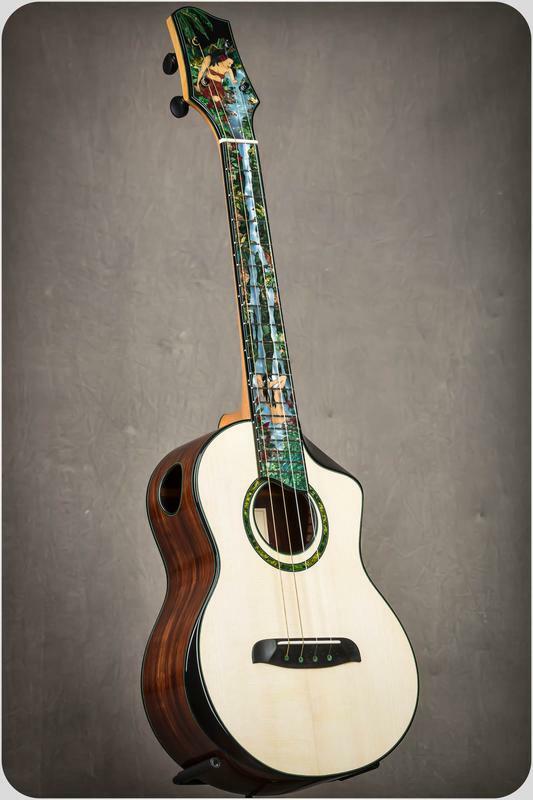 This cutaway slot head tenor offers a side sound port in the upper bout that acts as a personal monitor for the player. 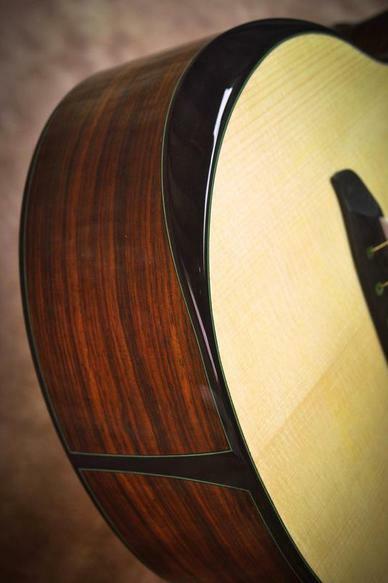 The offset sound hole is placed higher on the body allowing for a bigger resonating sound board giving it an exceptionally loud voice with good balance. 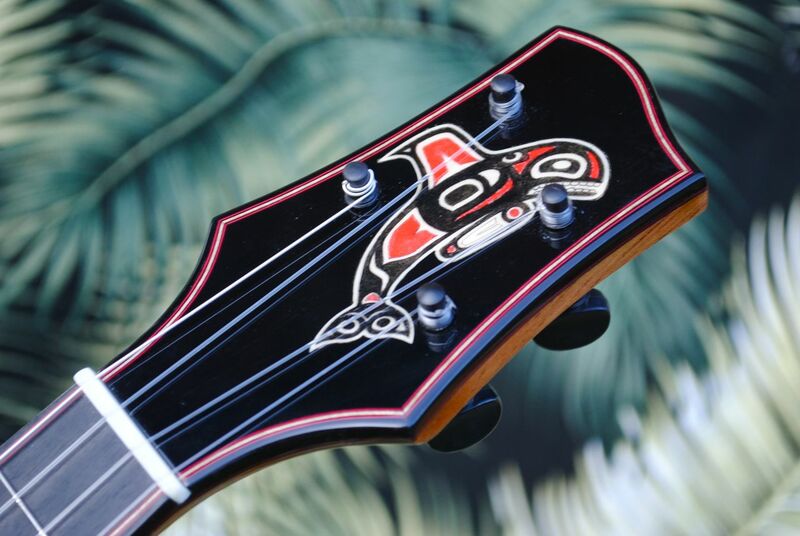 Ebony fret board, bindings, bridge and head stock veneer with bloodwood bindings Carbon fiber reinforced Spanish cedar neck. 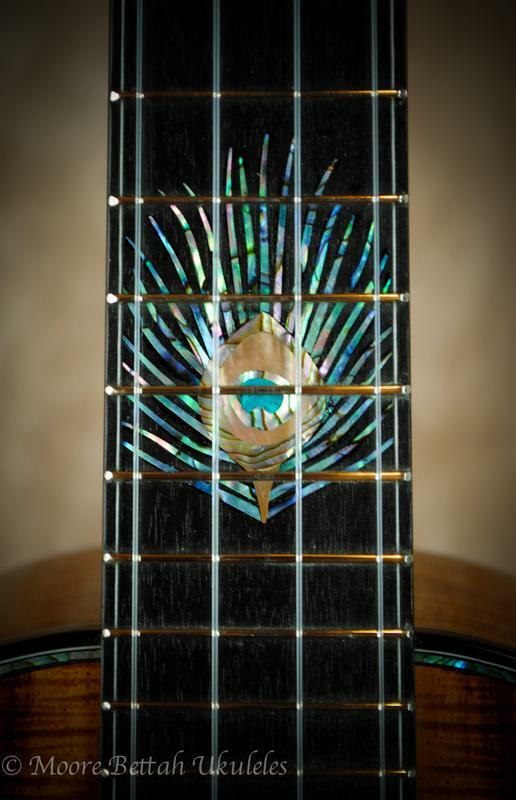 Paua abalone rosette and top and side fret markers. 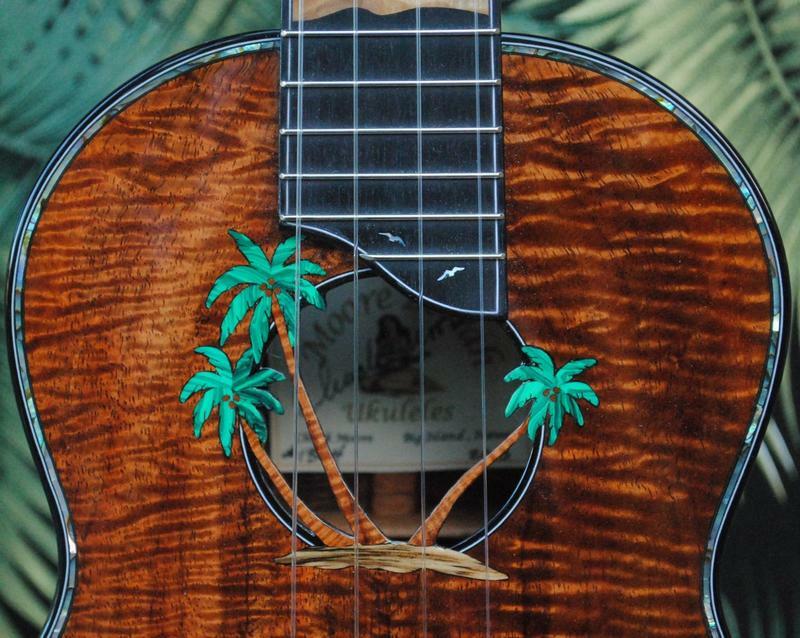 Grover Sta-Tite tuners. Bone nut and bone saddle. 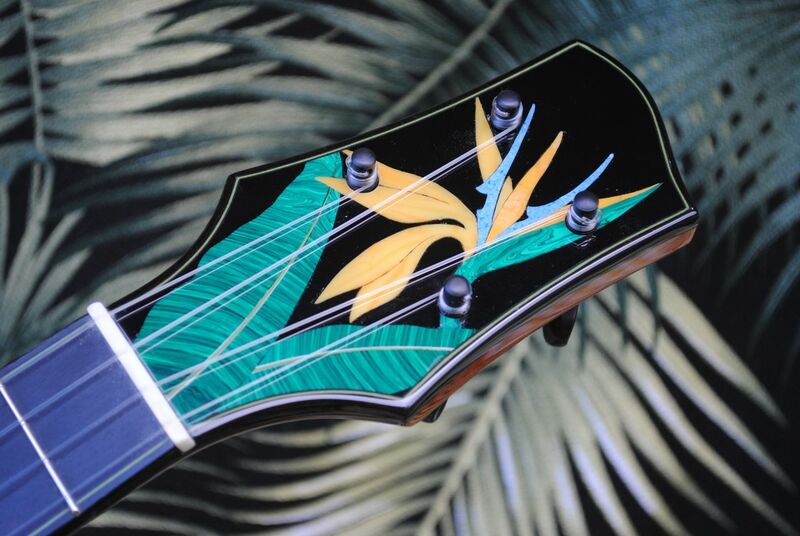 Strung in a re-entrant (high G) tuning with Savarez Alliance strings. 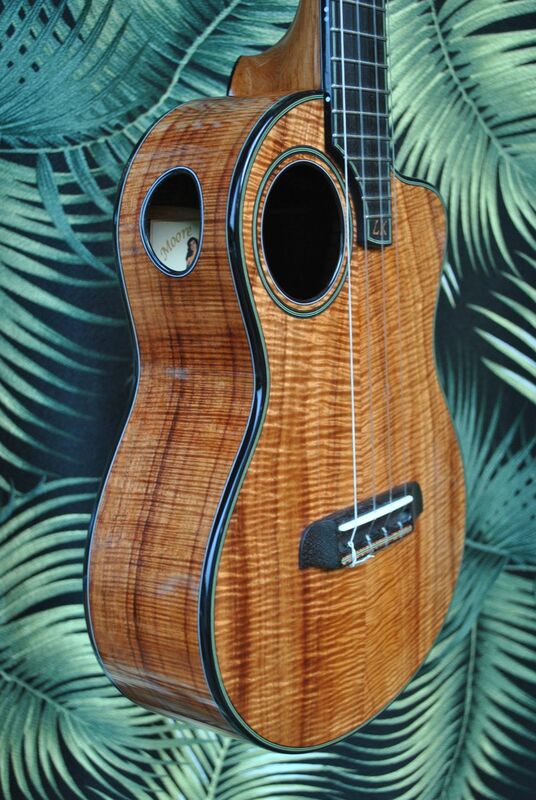 Glossy nitro cellulose lacquer finish. 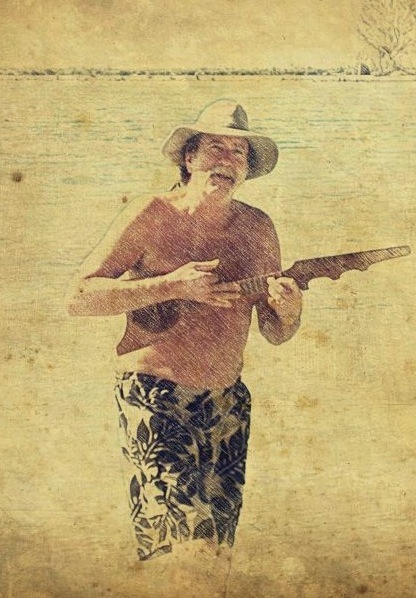 This is the second in a series I've done this year celebrating the Hawaiian hula. 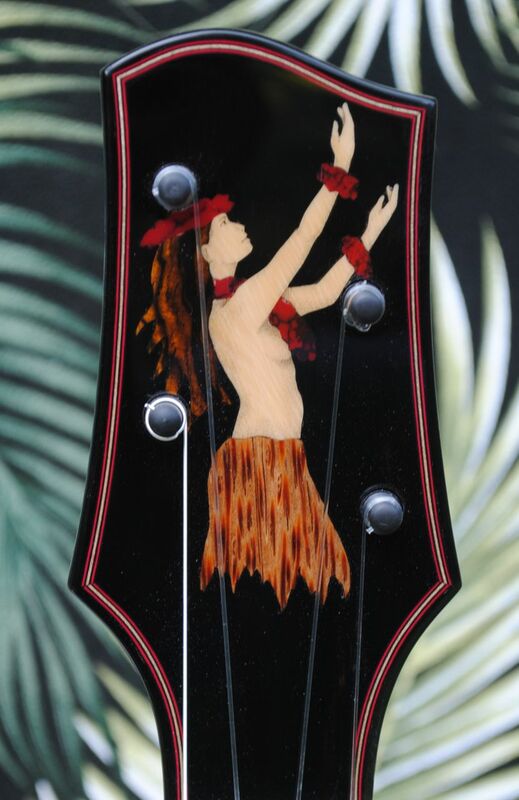 The body of the dancer is 40,000 year old mastodon ivory, her skirt is coconut palm and the hair is cocobolo. 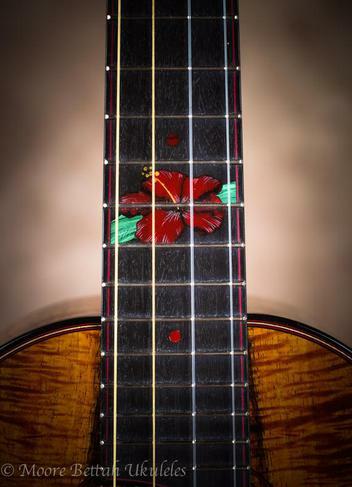 Her lei of red hibiscus is also complimented on the fret board extension. 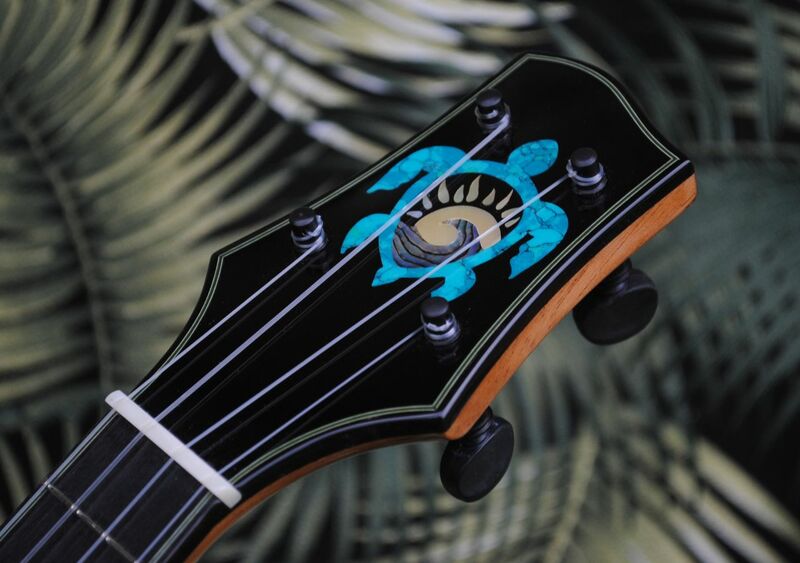 Peghed tuners are ideal for an application such as this where you don't want distracting tuner hardware. 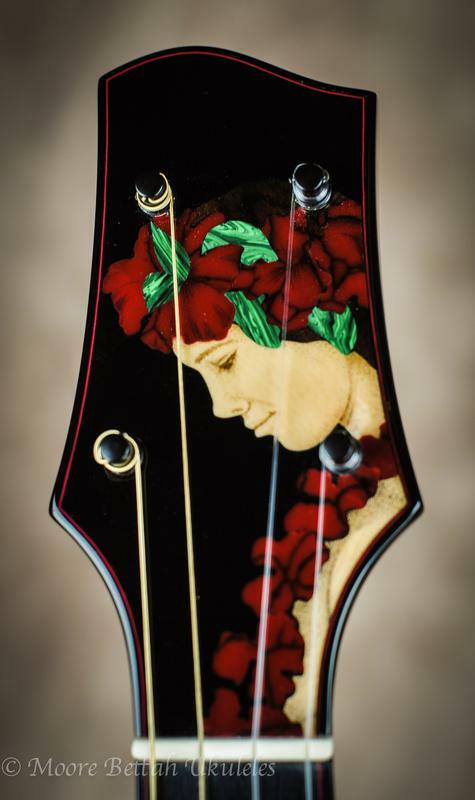 The purfling and rosette is custom made of red and black fiber and maple. 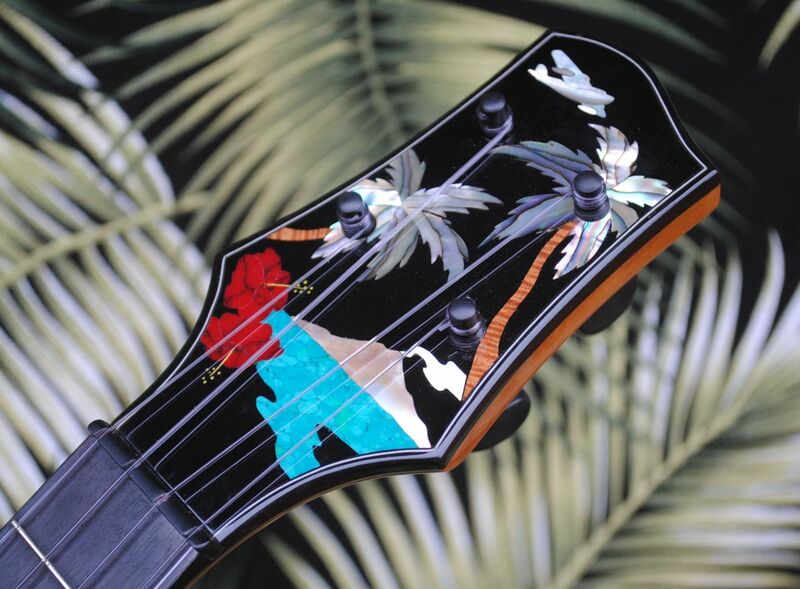 Inspired by my travels and memories of the South Pacific, these two tenor ukuleles are my submission to the Big Island Ukulele Guild exhibition held at the Wailoa Center in Hilo, Hawaii. 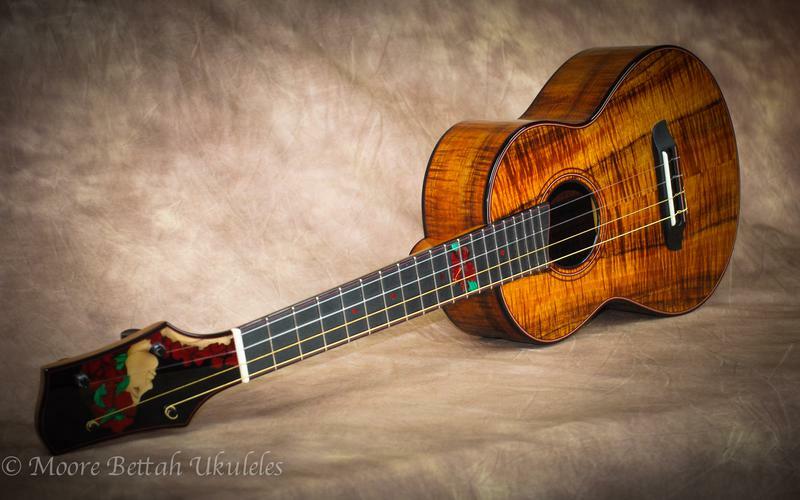 Both of these ukes represent hundreds of hours of work yet were especially fun for me to build. 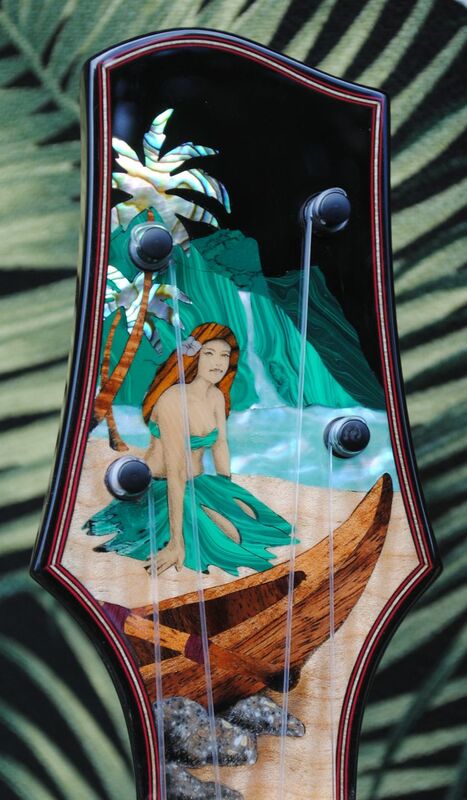 The inlays feature wahines that are "scrimshawed" in fossil mastodon ivory. 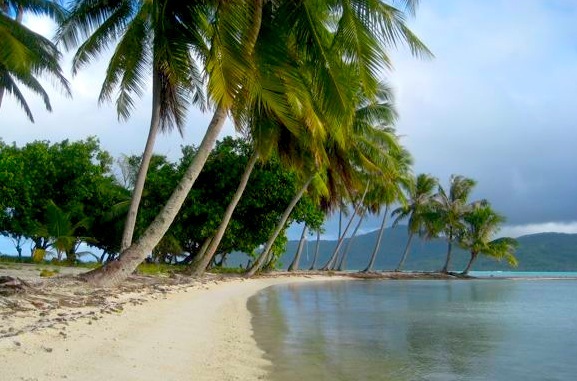 Other materials include shell and recon stone as well as the local woods koa, coconut palm and banyan tree. 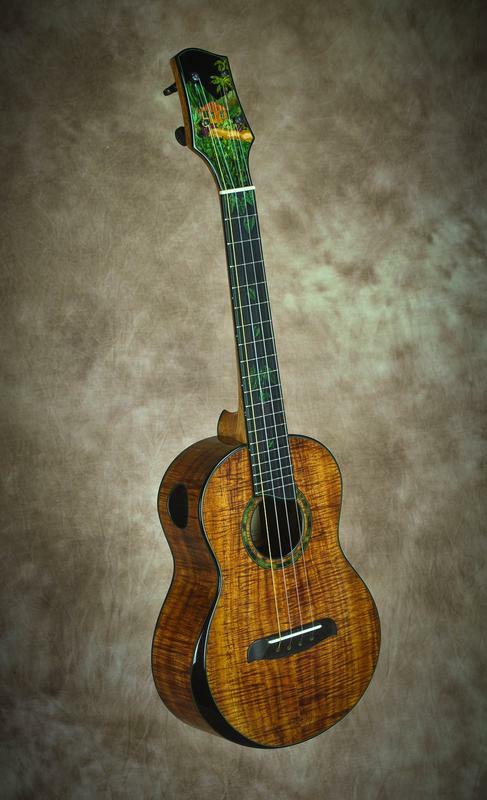 On the cutaway uke I've also added a Laskin-style arm rest bevel for more comfortable playing. Both of these instruments are easy playing with exceptional tonal qualities. 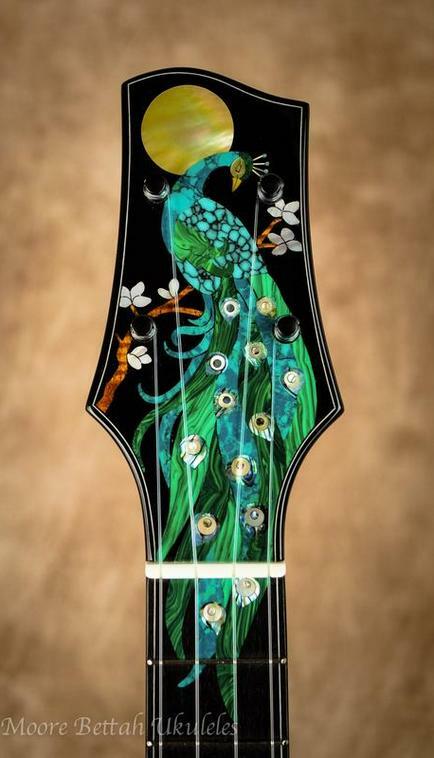 The stunning head stock inlay on this tenor ukulele was inspired by Massachusetts artist, Dawn Greene. The materials used were fossil mastodon ivory (with scrimshaw details), chrysocola and malachite recon stone and amboyna burl. 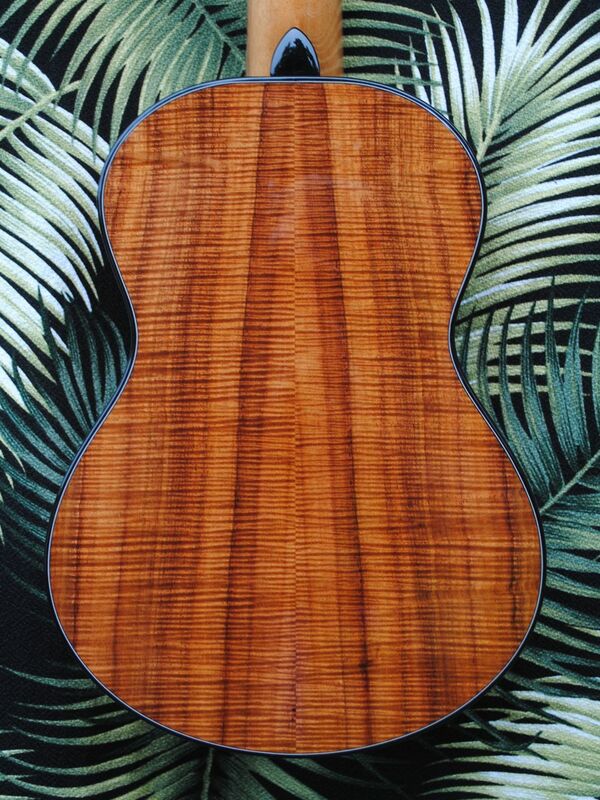 The body is 5A curly koa adorned with paua abalone purfling. Please Note: If you've never been to an art museum before or if you are offended by the representation of (gasp) the female breast, you are advised to view these pages with welding goggles. 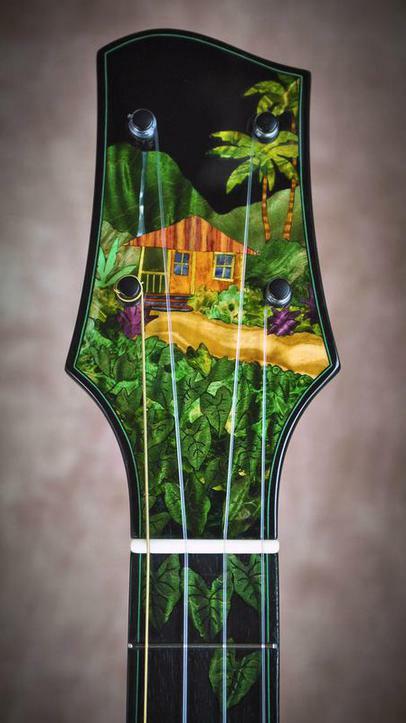 Once again, my entries for this year's Big Island Ukulele Exhibit pay tribute to the beauty and culture of the Islands of the South Pacific. I hope you enjoy the photo journey I've put together for you. 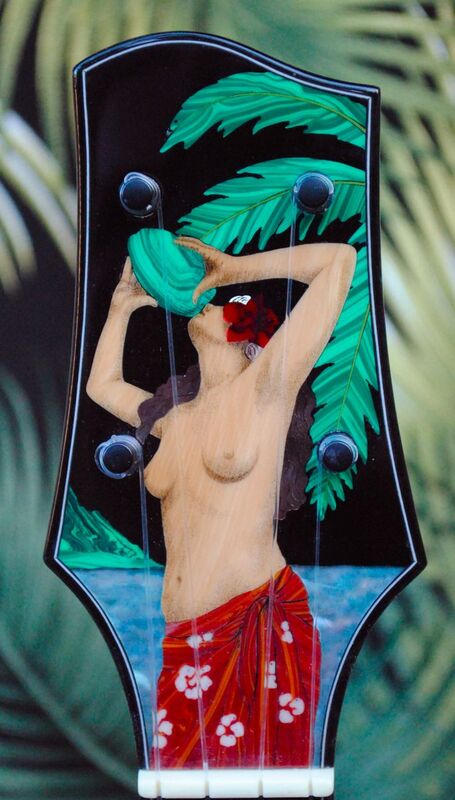 This uke is called "Coconuts" for hopefully obvious reasons! 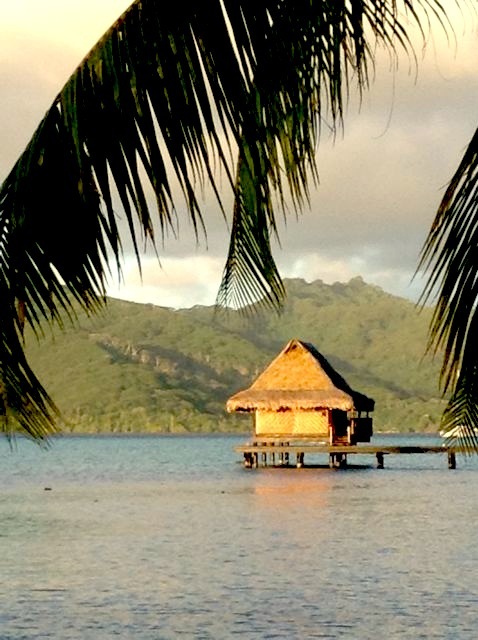 The coconut palm is the life blood of Oceania, providing food & drink, shelter, clothing and has 100 other uses. This is the curliest 5A koa I've ever had. 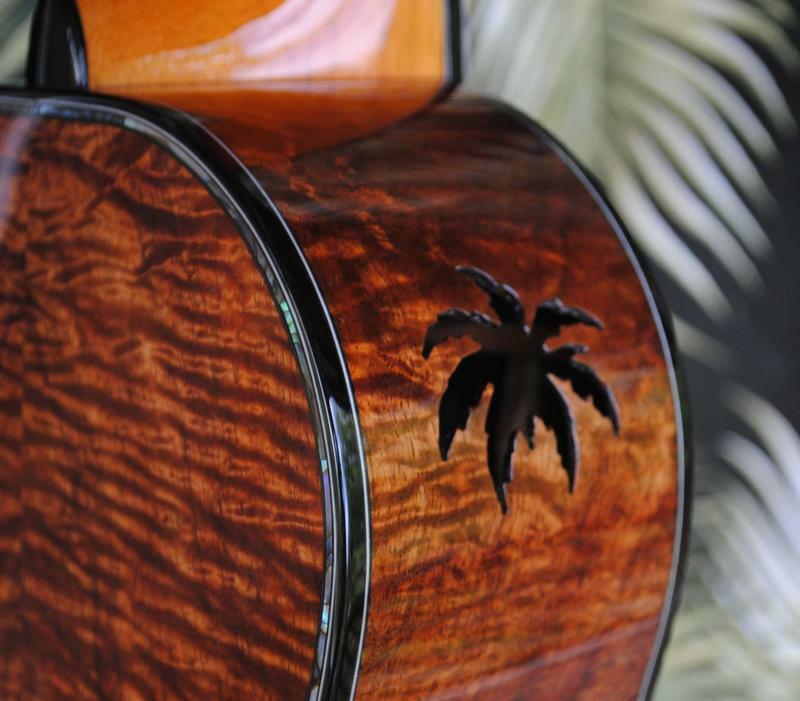 The sound hole and palm tree inlays are backed with carbon fiber. 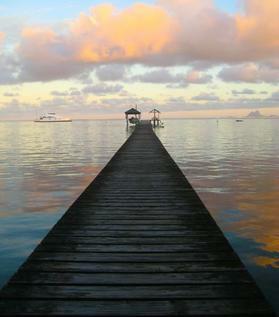 A tranquil lagoon. 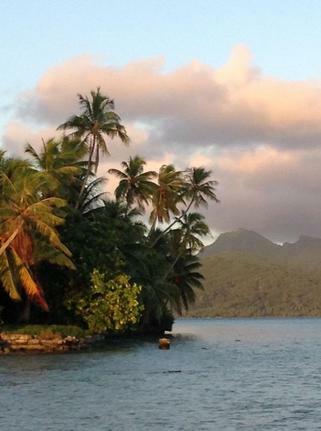 Many of the islands in the pacific are losing their palm trees due to global warming and the resulting rising waters. 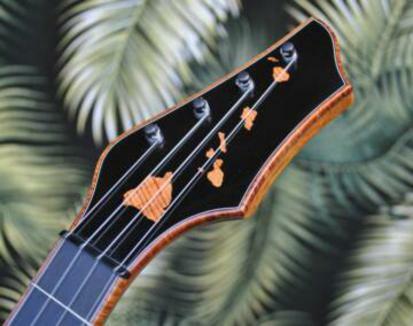 Palm shaped side sound port. 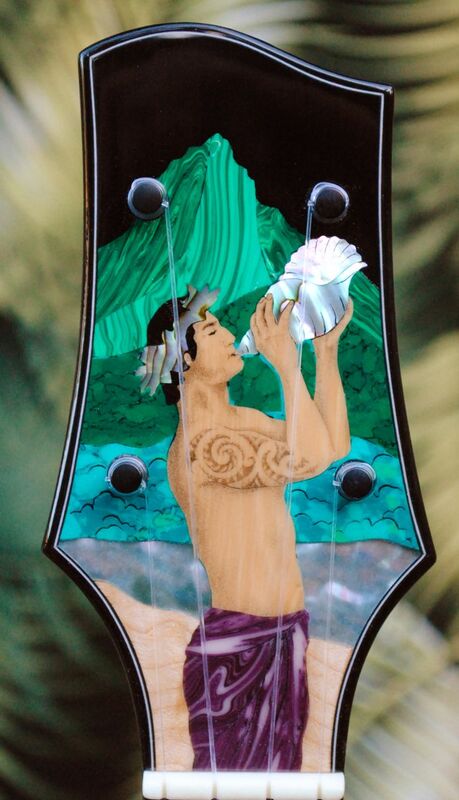 Paua abalone purfling on both the top and back of uke. A refreshing drink! The "milk" inside the coconut is so pure it was used as an emergency replacement for plasma during WWII. 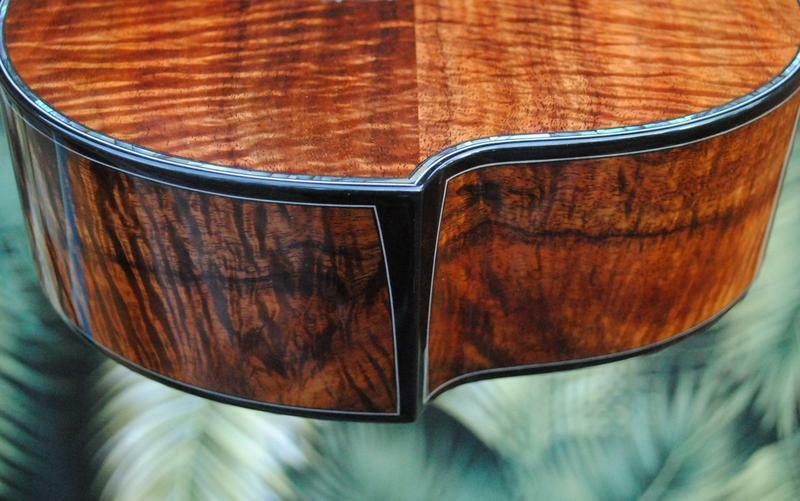 Among the materials I used in this inlay is fossil mastodon ivory. The 10,000 to 40,000 year old ivory is found under the permafrost in Alaska and Siberia. It is a great medium for scrimshaw, an engraving process first used by the whalers in the 1800s. 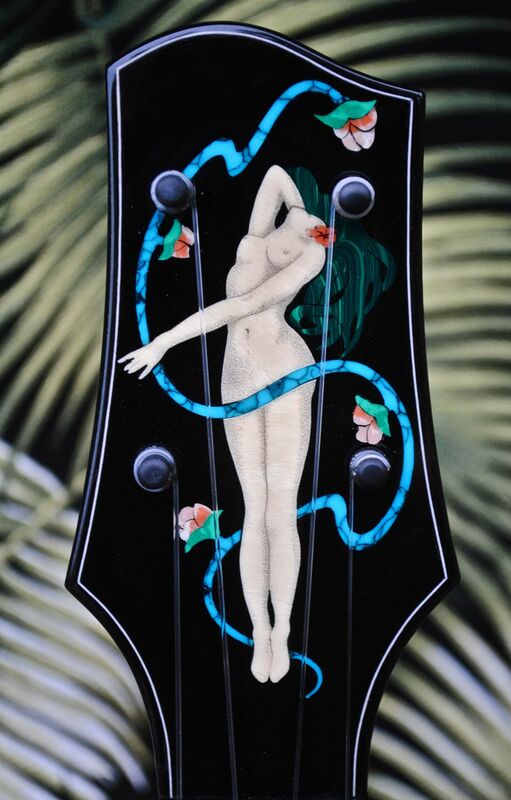 The etching alone for this inlay took me the better part of two days to accomplish. Other materials used were recon stone and Tahitian black pearl shell. 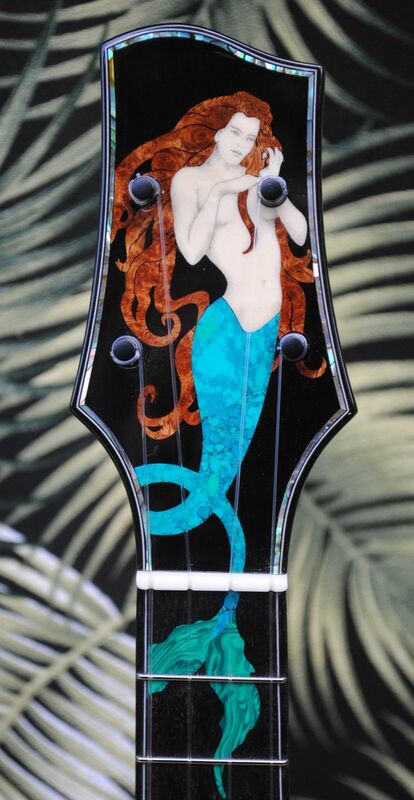 Note the detail in the pareau. 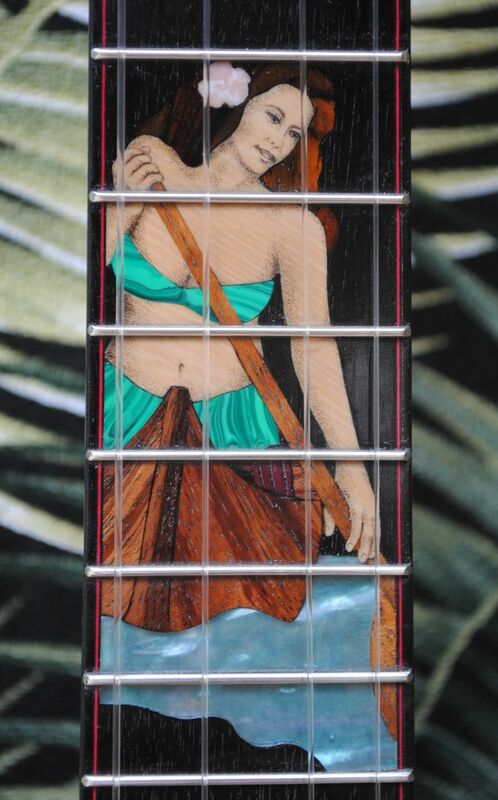 That's inlay! No paint or surface treatment is used. 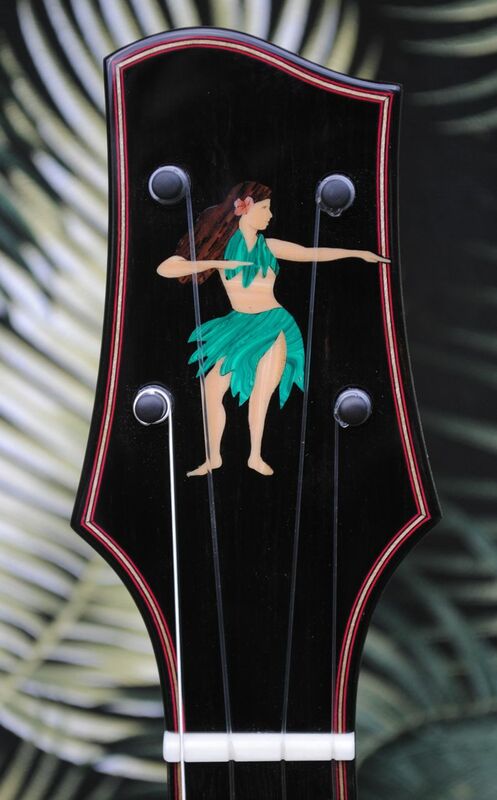 This one is just for fun but it does increase the size of the ukulele's body, increasing the volume somewhat. 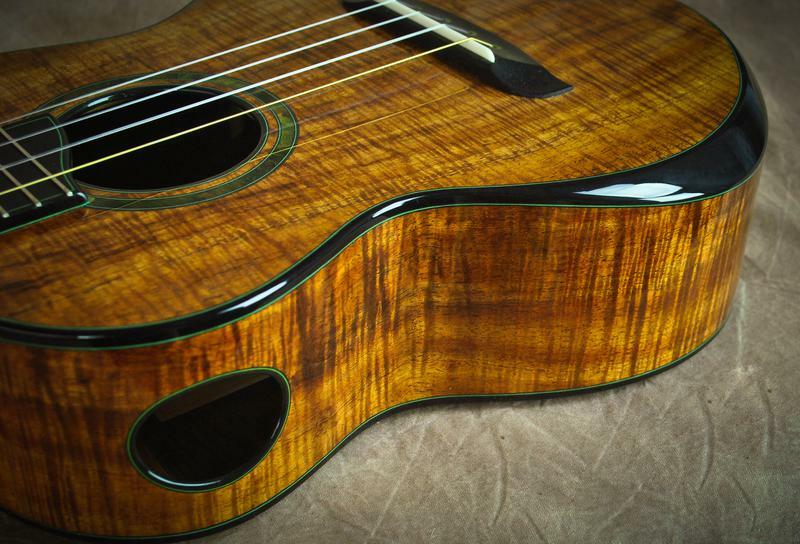 Beautiful grain in this koa! 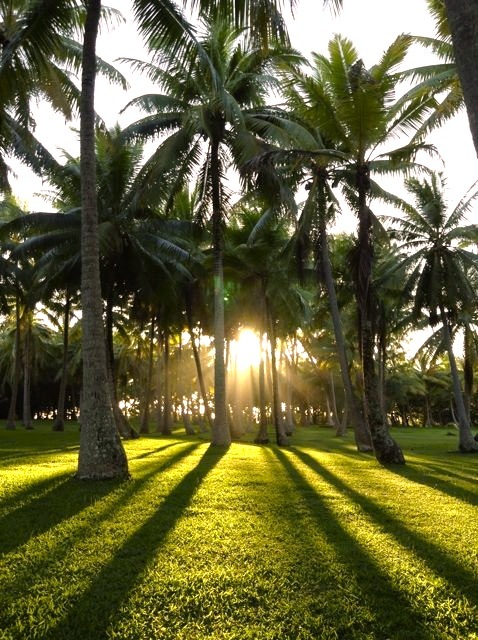 Sunrise in a coconut grove. A copra plantation on a lonely atoll. Before the advent of cell phones, conch shells and drums were the most effective way of communicating over long distances. 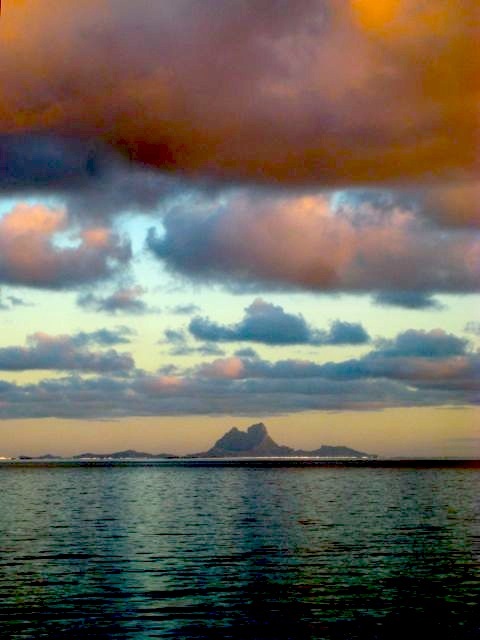 The ancient art of "Tatu" is predominant amongst the peoples of the Pacific Islands, both startling and delighting the early European explorers, many of whom followed suit! I've used fossil mastodon ivory here again which I've also scrimshawed. Other materials are recon stone, shell and maple. 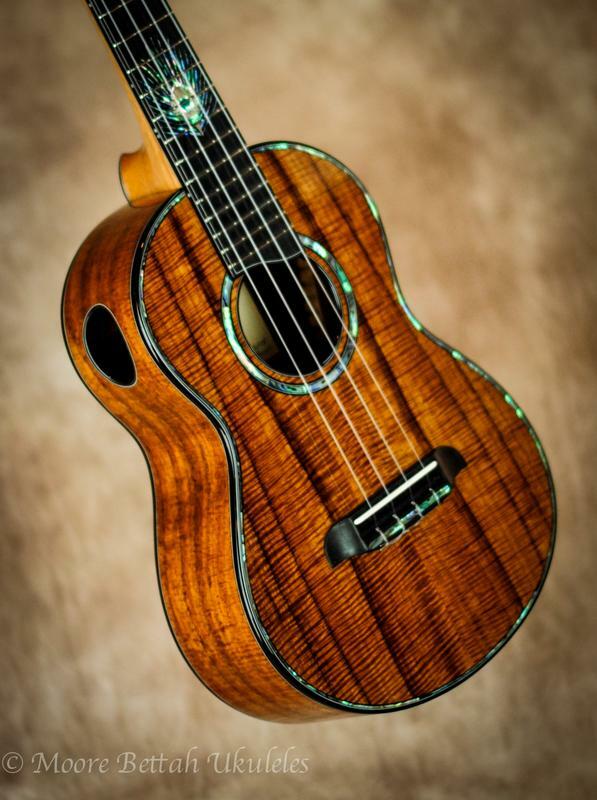 5A fiddle back koa and paua abalone purfing on both sides of the body make a stunning statement on this ukulele. 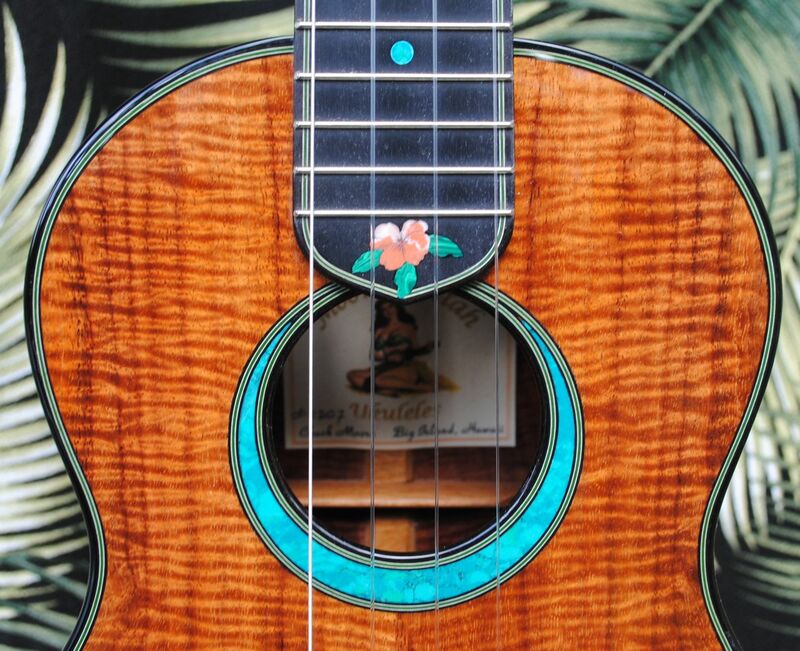 The out-of-the-way location of the sound hole allows me to brace in such a way that the effective resonating of the lower bout is increased by about 15%, giving the ukulele a bit more volume. The side sound port acts as a personal monitor, allowing the player to hear the sound more directly. 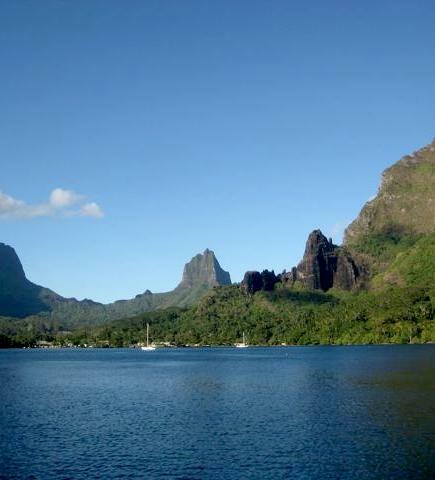 Cook's Bay (aka "Bali Hai") in Mo'orea where Captain Cook first dropped anchor in 1777. 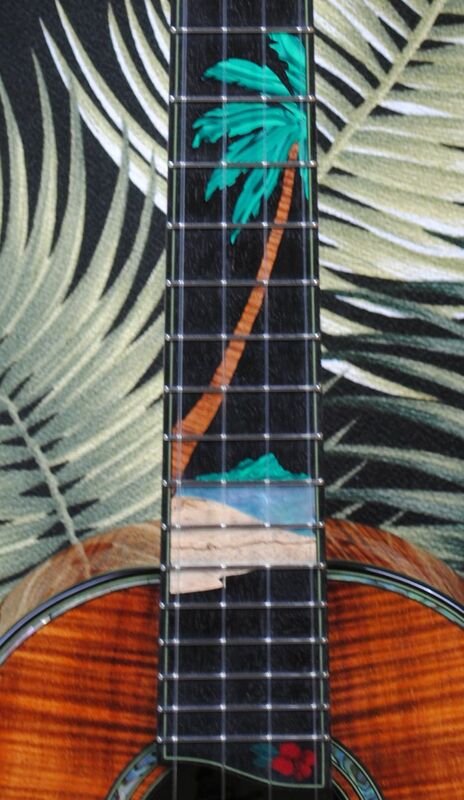 It's not hard to see where I got the inspiration for my inlays. 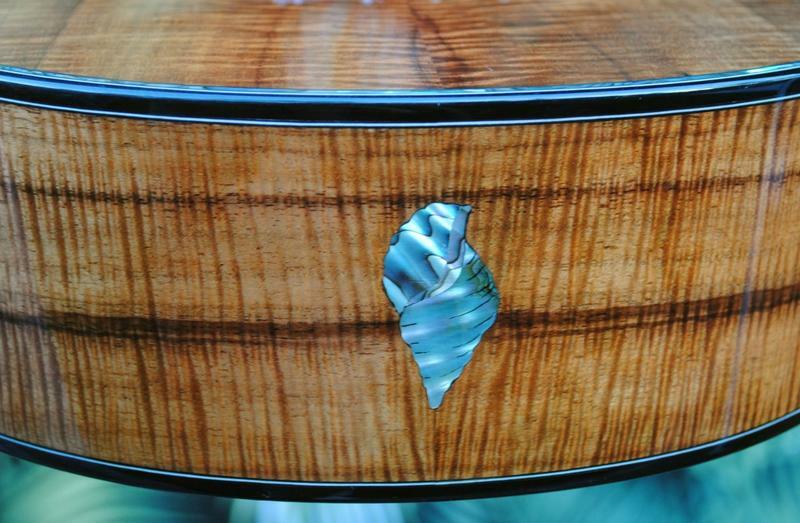 The materials I used are paua abalone, gold MOP, koa, coconut plam wood, spalted autograph tree, corian & recon stone. Thank you for following along with me on this little adventure. Hopefully you've been able to catch a glimpse of where my inspiration comes from. 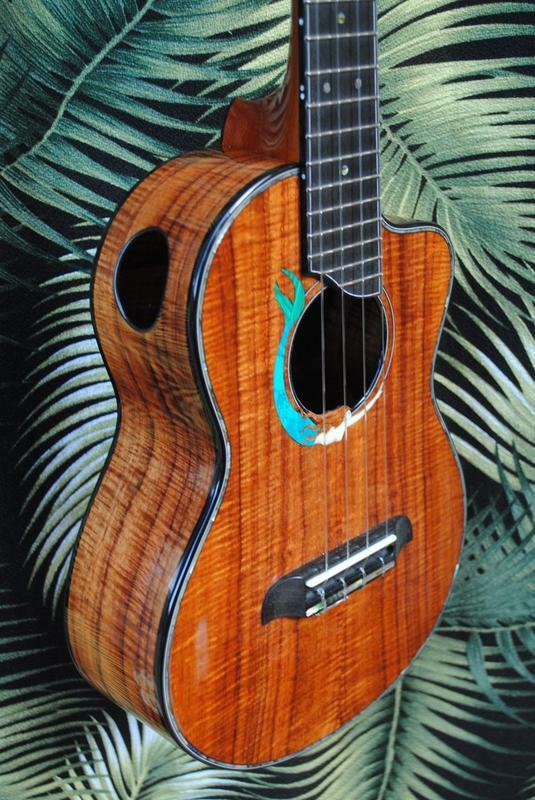 Building ukuleles and living & traveling in Oceania are the passions in my life. 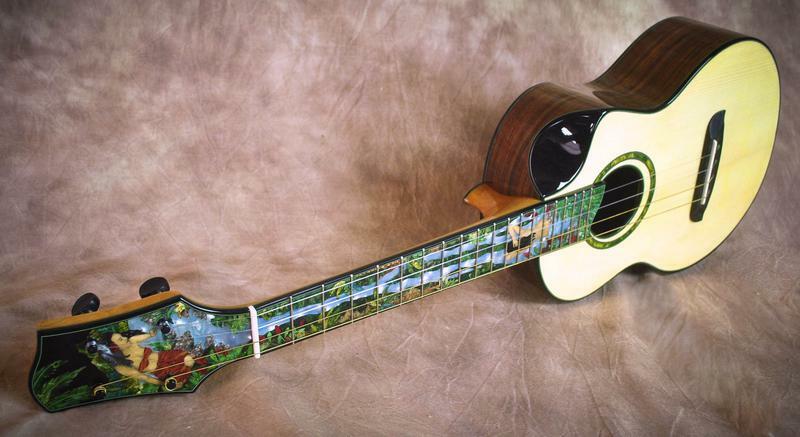 The ukuleles featured here took me over three months to build and can be seen at the Big Island Ukulele Exhibit running through most of October, 2013. See my home page for details. All photos, for better or for worse, we're taken by me. 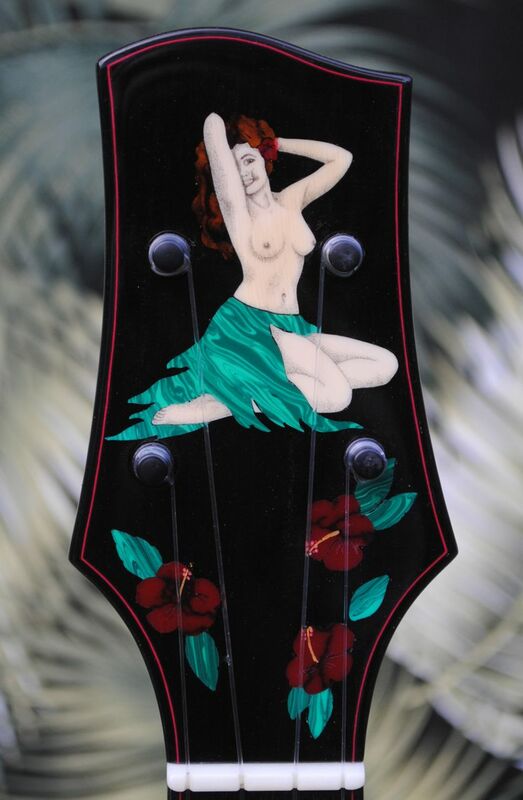 This lovely wahine obviously loves red hibiscus flowers! I've used fossil mammoth ivory to portray her and scrimshawed her facial details. 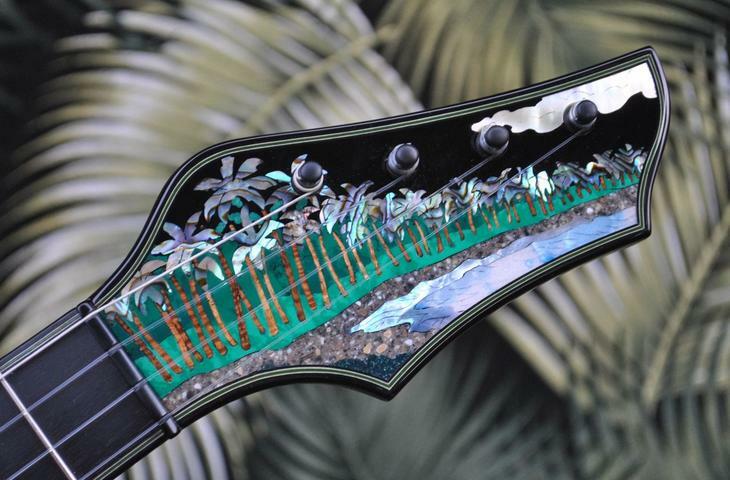 Scimshaw is actually engraving into the ivory using a technique called pointilism, using fine knives and artist's oils. The scrimshaw itself represents a full day's work. I think the result was worth it! The culmination of my life's work as an artist and craftsman. 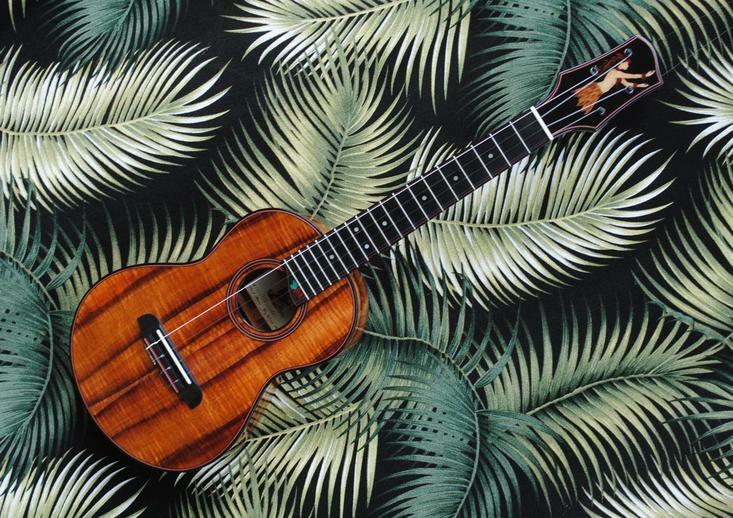 This stunning tenor uke was inspired by my years living on the east side of Moloka'i where many of the old Lo'i (taro patches) are being painstakingly restored. 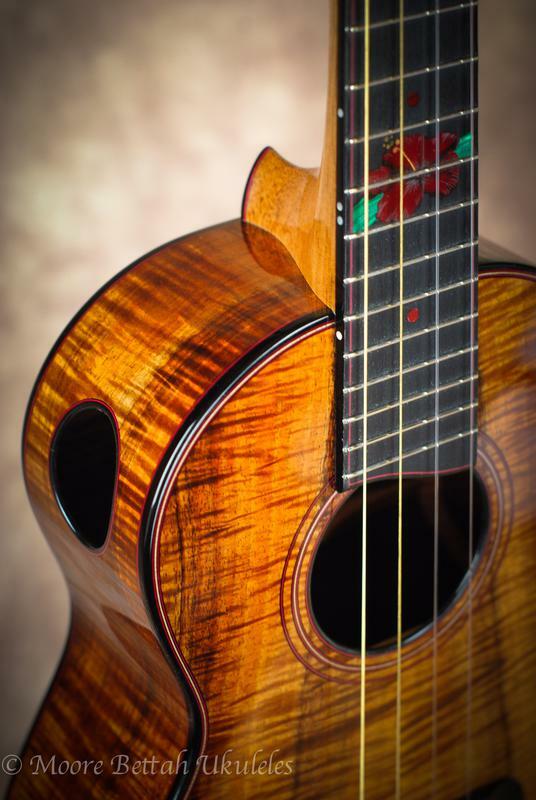 It features 5A curly koa, side sound port and transitional arm bevel.